The saddle blanket that you drape over your horse before putting your saddle down plays a very important role. It prevents your horse from developing sores as a result of friction between a saddle and a horse’s back. It also keeps your horse comfortable while you’re riding by evenly distributing pressure. You should take steps to care for your saddle blanket to increase its lifespan and protect your horse. Here are some steps you should use to do it. When your saddle blanket gets dirty, you might be tempted to simply stick it into the washer and dryer like any other blanket. The problem is that not all saddle blankets are designed to go into the washer and dryer. You should read the label on it to see how to care for your saddle blanket properly. You might be able to wash but not dry it, or you might not be able to put it into the washer and dryer at all. Whether you’re able to put your saddle blanket into a washer and dryer or not, you should make sure that you clear any horse hair and dust from it first with a small vacuum. Excessive amounts of horse hair and dust on a saddle blanket can make the blanket uncomfortable for your horse and prevent the blanket from doing the job that it’s intended to do. Is your vacuum struggling to remove all of the horse hair, dust, and other dirt on your saddle blanket? If so, you can use cold water from a garden hose to spray it down. You should steer clear of spraying directly down on to the blanket and aim the hose at an angle instead to drive hair, dust, and dirt toward the edges of your blanket. You should then allow the blanket to air dry away from any heat sources and the sun since they could cause damage to it. Is it time to replace your old saddle blanket with a new one? 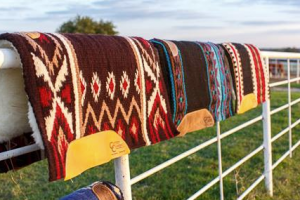 Cutter Classic can provide you with your choice of one of our excellent saddle blankets. We have medium weight pads, heavy weight pads, alpaca pads, and more. Call us at 580-276-6126 to place an order today!